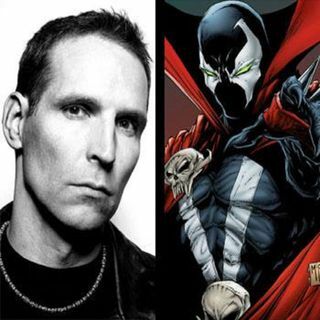 Todd McFarlane took comic book art and turned it into...well....better comic book art. Let's talk about how this young and aspiring baseball player from Canda turned Marvel upside down by reinventing SpiderMan. Then left Marvel to start his own wildly successful comic book company: Image. It was here we met his creation called Spawn. We also talk about the toys and lawsuits too...don't worry. Today's show is sponsored by: ... Maggiori informazioni 1994 the podcast, is about all things pop culture dealing with the year 1994! It’s hosted by Brooklyn comedians John Bilancini and Brandon Ream, and produced by Amy. She’s a girl. On the first and third Friday of every month, John, Brandon, and a special guest comedian break down television, movies, snacks, music and more from each month of the year 1994. If you enjoy comedy, wallet chains, Ace of Base, and/or Pulp Fiction and miss the 1990s, you have to check out 1994. 1994 is available on iTunes, Google Play, and Podomatic, and can be found at @1994podcast on Twitter and on Facebook.